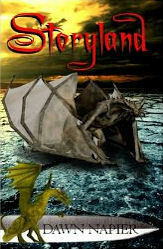 Storyland is a unique vision of the urban apocalypse novel. Creatures of fantasy and nightmare have returned to the real world, and human beings are now an endangered species. Fairytale monsters have come to life, and the lessons they teach are grim. Out of the ashes of civilization's ruin rises Alicia, a gritty young girl born and raised in this terrifying new world. With a pistol in one hand and her trusty machete in the other, Alicia forges through nightmare after nightmare in search of a safe haven and trustworthy friends. It is a dark realization, but she learns in her travels that some of the monsters wear human faces.